In THE CHANDELIERS, “Little Rufus Chandelier was not big enough to perform in the show,….” Rufus, instead, watches (and learns) from the wings of the stage of his family’s nightly show until one night everything started going wrong. Rufus came to the rescue. He found ways to save the show from fixing the costumes to making the sound effects. It was after that show that “…Maximilian Chandelier made a special announcement:…’we could not have done it without the wonderful Rufus Chandelier!’” Rufus was recognized before the entire audience as a very important member of the family. He felt the limelight and heard the applause. Rufus was admitted into the limelight – he found his place on the stage of life. Now, everyone knew he was important. Let’s all do that for our kids. Put the spotlight on them. Let them know they are important. All human beings need to be recognized. They need to know they matter. Don’t you? Your kids do too. They need your attention. They need to connect with you. Even brand new babies need to know they are important to the people around them. It’s not enough to just make sure they are fed, clean and warm – even though that is what we spend most of our time doing with babies. A story about an orphanage is often told to explain how important human attention and human contact is for babies. In this orphanage, the babies were well cared for. They were fed, kept clean and warm. But, they were not held, cuddled and given person-to-person contact. Sadly, the babies didn’t survive in this orphanage. They were missing one essential thing – attention. They needed to be held, touched, cooed at and smiled at as much as they needed food. Older children also crave this attention. Sometimes children misbehave to get that attention. They would rather have you angry with them than feel you don’t care about them at all. After night after night of performances, that one night, Rufus showed the family what he was capable of. Fortunately, Maximilian was tuned in to Rufus enough to notice and appreciate what he had done. It wasn’t scheduled. It wasn’t even expected. But, Rufus was ready for the recognition that he had earned and Maximilian made sure it happened. What would you like to be famous for? Good cook, singer, smart, strong, faithful? 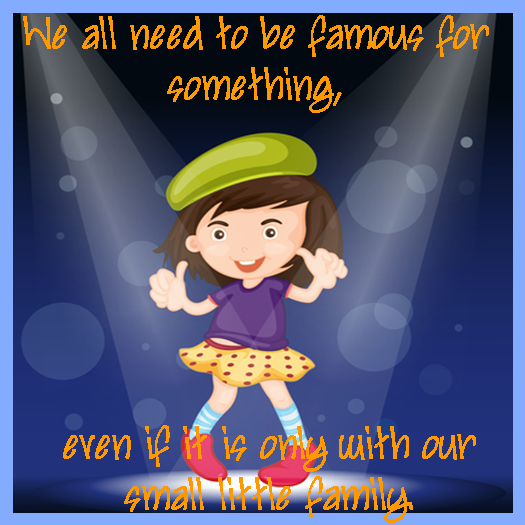 We all need to be famous for something, even if it is only with our small little family. When can a child learn to do something really well? Every child learns at his own pace so what one child can do at four, another can’t do well until six. And, not many tasks or accomplishments require a certain size. Even in basketball, there are exceptional players that are much smaller than the rest of the team. So, when a child wants to do something, it’s best not to say, “When you get bigger.” That takes the power away from the child. He has no power over getting older. His determination doesn’t matter. The amount he practices won’t matter. Instead, ask yourself, what does my child need to know and be able to do to be good at what he is asking to do. Let him begin to try one small part of the task. For example, if he wants to ride horses when he is only two or three and you think that wouldn’t be safe. You can tell him he needs to know a lot about horses before he can ride them safely. You can find ways for him to begin to learn – read about them, visit them, pet them, feed them, etc. Decide: Your child can do many things well. Practice: Today, put a message by your child’s lunch or on his pillow at night that says, “You are the best at ________. Repeat everyday for a week. Today’s Decide and Practice daily parenting tip was inspired by our featured picture book, THE CHANDELIERS. Read the book to a child in your life each day as a reminder of what you are deciding and practicing that day. This entry was posted in Communication, Nurturing and tagged attention, doing messages, growing up. Bookmark the permalink.